The path to an illuminated, glowing face may be found in the power of the high love energy crystal, rose quartz. This foundation will lead your skin to a higher vibrational place. 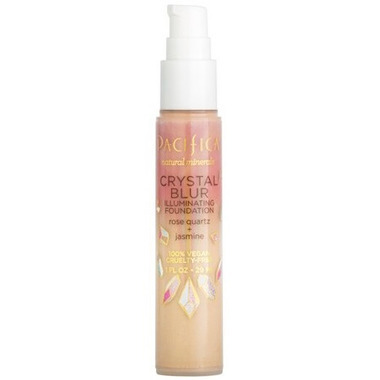 Medium coverage with blurring minerals to help perfect and add illumination. Ingredients: aqua, caprylic/capric triglyceride, jojoba esters, glycerin, sorbitan sesquioleate, potassium cetyl phosphate, sorbitan olivate, cetearyl olivate, jasminum officinale (jasmine) flower extract, cocos nucifera (coconut) water, carthamus tinctorius (safflower seed oil), withania somnifera root extract, sodium hyaluronate, macrocystis pyrifera extract, xanthan gum, quartz powder, hydroxyethylcellulose, potassium sorbate, sodium benzoate, sodium dehydroacetate, citric acid, parfum (natural). May contain: titanium dioxide (77891), iron oxides (CI 77492, CI 77491, CI 77499).